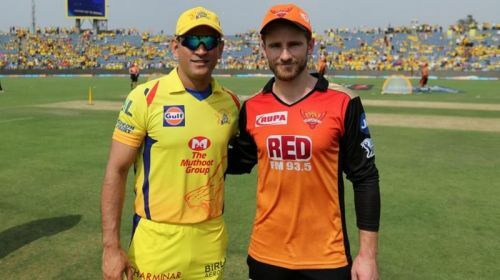 IPL 2019: Match 33, SRH vs CSK Match Prediction: Who will win today's match? Two teams with contrasting form will meet at Hyderabad on Wednesday. Chennai Super Kings are a team to beat in IPL 2019 so far. MS Dhoni-led side has lost just a single game so far in the tournament and has clicked as a unit. The Sunrisers started the tournament pretty well but has lost momentum and are now in danger of losing out on a place in the playoffs. They will have a daunting task of defeating the mighty Superkings. The exceptional form of the skipper MS Dhoni is a confidence booster for the team. Also, Faf du Plessis has done well after coming in the playing XI. CSK's bowling has been it's biggest strength. Imran Tahir and Ravindra Jadeja have choked the opposition batsmen for runs in the middle order along with taking crucial wickets. Deepak Chahar has been impressive with the new ball as well as in the death overs. Poor form of some of the senior players is the only cause of concern for CSK. Shane Watson has looked completely out of sorts while Ambati Rayudu, apart from his half century against Rajasthan Royals, has struggled to get going. The only plus point for Sunrisers has been the superlative form of their openers, David Warner and Jonny Bairstow. The dynamic openers will have their task cut out against a strong CSK bowling line-up. Poor middle and lower order batting has been a major reason for SRH languishing at 6th place in the points table. None of the Indian batsmen have been able to do justice to their place in the side. Also, Sunrisers' bowling, which is considered to be it's strength, hasn't really clicked this year. Bhuvneshwar Kumar is far from his best in the tournament yet. And even though he has bowled economically, Rashid Khan hasn't been able to take wickets. With the kind of form CSK is in, they will start as favorites against the struggling Sunrisers. Sunrisers already has too many issues on their plate and it will take a herculean effort to defeat the rampant Superkings.